The mission of the Web Payments Working Group is to make payments easier and more secure on the Web. W3C’s payments standards aim to streamline the Web checkout experience and increase payment security. Reports of early experiments from Shopify and J.Crew suggest that the new standards can significantly speed up checkout. Users can store and reuse information to complete online transactions —on mobile, desktop, and other devices— more quickly and accurately. 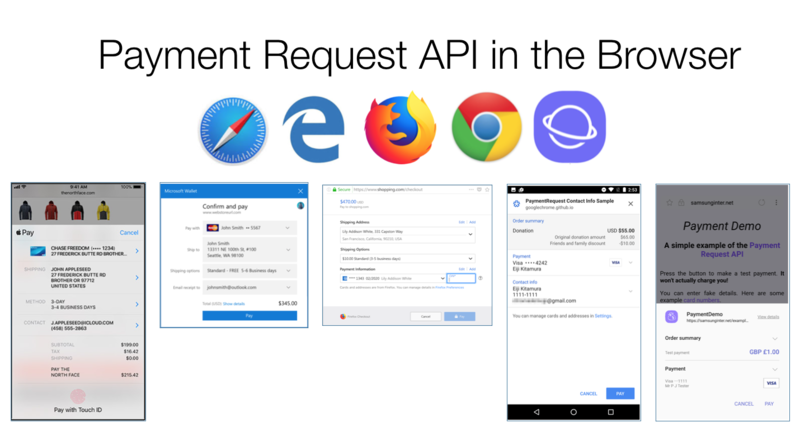 Chrome, Edge, Safari, and Samsung Internet Browser now ship with support for the Payment Request API to enable streamlined checkout. Stripe, Braintree, WePay, Payone, Paysafe, Bluesnap and other merchant services providers have begun to support the API in libraries for their customers. The Web Payments Working Group has also published Payment Handler API and Payment Method Manifest to foster payment innovation on the Web. These specifications make it possible for users to make payments via third party Web-based “payment handlers,” an avenue for payment method and security innovation. Chrome (as of release 68) supports the Payment Handler API. W3C team has been in conversations with several European organizations working on “open banking APIs” in light of European payments regulation (Payment Services Directive 2(PSD2)). W3C team continues to engage with related organizations including EMVCo, PCI Security Standards Council, ISO 20022 RA, US Payments Forum, Global Platform, NACHA, and others. Since May 2018, a number of organizations have joined W3C for payments work, including Bank of America, Barclays Bank, Beem It, Coil, NACHA, Reach, and Wells Fargo. At the October 2018 TPAC the Web Payments WG announced that they are closer to advancing Payment Request API to Proposed Recommendation; they clarified the meaning of “canMakePayment”; have dropped supportedTypes from Basic Card; discussed Merchant Adoption and User Experience; as well as hosted a joint meeting on Internationalization. Please see more information on the Web Payments WG site if you’re interested in joining in this exciting area. Web payments are playing a huge role in the online business industry. It must be organized in an appropriate manner.